Who's kit is that? Nice that it has a press with the joints. Have been running these bushing for several years now in that position. http://www.hrpartsandstuff.com/ Scroll down in "New Products", Delrin bushings. Don't forget to take a measurement. 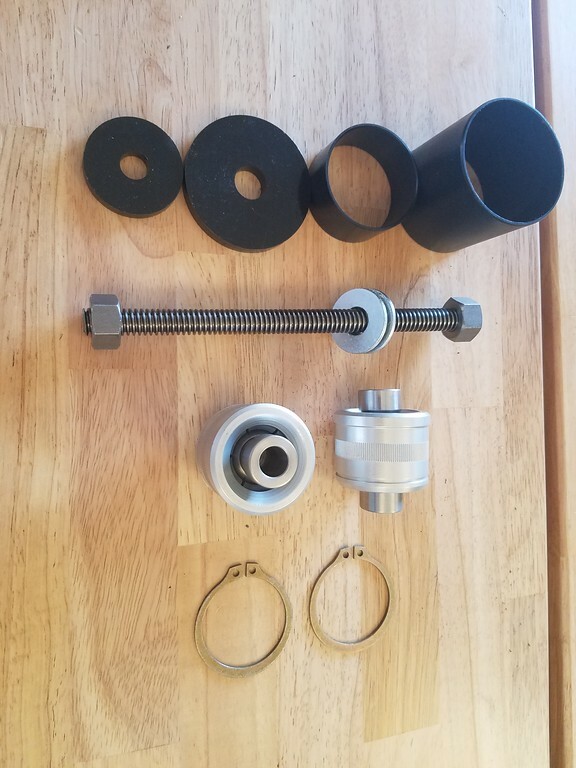 This is Ridetech's R-Joint kit. QP put their upper housing ears 6.5" above axle centerline (center to center). Everything is back together, axle articulation is much easier and smoother now. Will road test today but dont expect any issues. Main change will be to see how the inside rear tire acts on track next weekend. 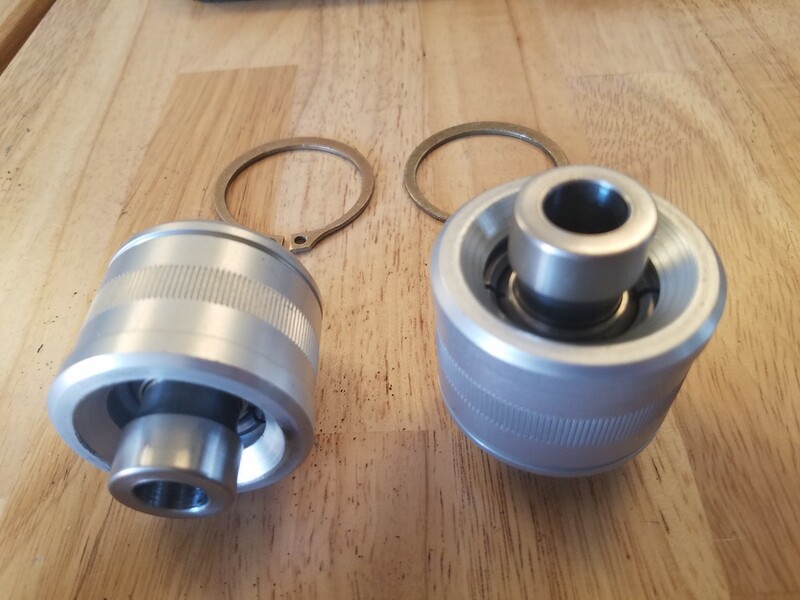 Had looked at the R-Joint when they come on the market, didn't see that bushing replacement being sold then. Global West and Currie have sold a Johny joint version to install in the rear bushing location for years, very pricey and no install tool sold by them. The R-Joint and install tool are affordable. I've been running a HRProducts Delrin joint in that location for 10 years, no problems, good articulation. Under heading "New Parts" scroll down to see the bushings. So 6.5", about the same as the 12 bolt and about 1" higher than the stock 8 1/2" rear. mmc427ss - running the same delrin joint - put it in after I installed their anti sway/roll kit (OMG). Improvement in feel and got rid of some noise on turns. You can buy/make a tool or rent (I borrow it) from HRPartsandStuff. Thanks for the reminder that there are so many small things one can do to improve our cars. Gordon, looks like HR is just down the road from you, cool. Mason I would assume the Speedway joints are steel on steel or nylon. Have been running Delrin bushings at all 16 location for decades. When I removed the Global front 8 Delrin bushings that were almost 20 years old they were still in great shape, no need to replace the Delrin. Good Guys Dual in the Desert starting Froday morning. I don't think there is room to make them any shorter on the 9" anyway, the large washer on the bushing press tool interfered with the top of the housing a bit when trying to press the new cartridge in place. If the ears were any shorter, that would be quite an issue. The speedway ones (which I think are actually UB) have a replaceable monoball. Im not sure how good of a monoball they use though, Id buy a teflon lined one. Those rubber inserts are made for circle track guys to get away with cheating but Im sure they help with dirt and whatnot. Good luck this coming weekend, get that car into the shootout! Considering most of the contenders are true race cars at that event, and sponsored by the big boys, any finish in the top 25 is outstanding. Thanks... That's the goal (actually winning one round in shootout is the real goal). In the spring I made the shootout pretty easily but lost in round 1. This fall though I think a lot more of the big guns will be there and 22 of the 32 positions are already taken...so the rest of us are racing for just 10 spots in the shootout. 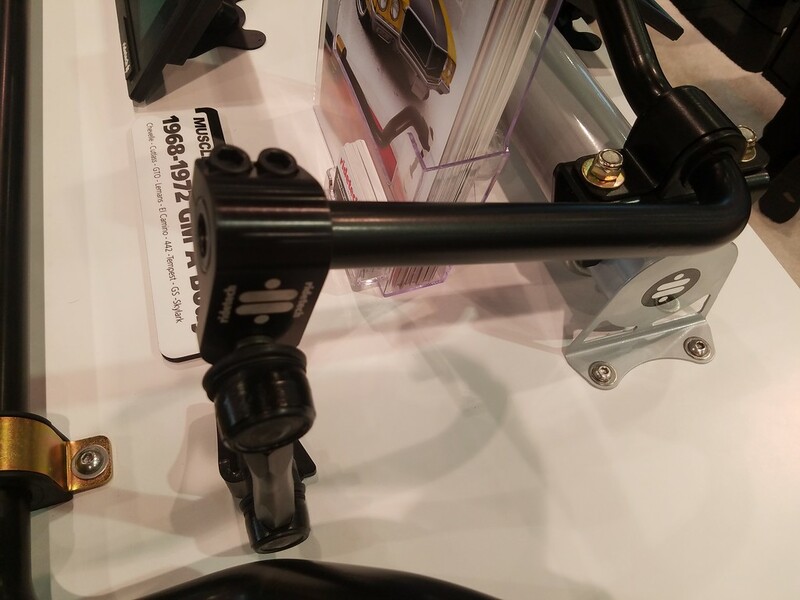 At SEMA I also noticed that Ridetech has a new rear sway bar setup for A-Body cars with this slick adjusting collar to let you dial the bar rate in easier. Bret mentioned it would also work on a G-Body with a few adjustments so they made me up one and it's on the way to me now. I should have it in time to get it installed before heading to Good Guys on Thursday. When I've run rear bars in the past (tried several times) I had a lot of trouble with the bar picking the inside rear tire up in turns. This had a LOT to do with the outside front tire compressing so much and the resulting diagonal roll lifting the inside rear. Now that I have basically doubled the front sway bar rate, the inside rear has way less tendency to want to lift the tire which has me wanting to try a rear bar once again. This means that I'll have to soften the rear spring rate considerably as well. I'll have a trunk full of parts and tools with me to make changes at the track if needed, but I think we have a pretty good idea of where to start with the setup. Worst case I can quickly put it back to where I know it works by changing springs and disconnecting the rear bar...but I hope that won't be necessary and I can just work on fine tuning the new setup with way more ways to adjust it now. When I installed the Spohn Pro Tour bar, a link bar, in the instructions it stated the link should be perpendicular when the car is at ride height. The bottom links will swing forward and rearward as the rear is moved from compression to rebound. When you change the rate setting on the bar it was necessary to loosen the u-bolts on the rear tubes, rotate the bar's mount on the tubes to make the links perpendicular again. This I thought was not the way to do that. New frame brackets were made with three hole locations. The links are removed from the bar and bracket and moved to corresponding holes in the brackets and bar, this maintains the links perpendicular without having to loosen the u-bolts on the rear. Just remove the link on one side, two bolts, remove the two bolts on the others side to the new location, install opposite side in new location and done, rate changed without playing with the u-bolts. Always check bar rotation, full compression to full droop, and link perpendicular when adjusting these link bars. Interference is possible with tailpipes. Would think that bar rotation clearance at the centersection should not be a problem if the bar dogleg is engineered correctly to allow full travel of the bar. The Spohn bar was never checked for this with an 8 1/2" rear, it hit the centersection at full compression. Modifications had to be made to not hit the rear. I like the engineering of the new Ridetech rear bar, Delrin in the rear mounts, the sliding adjustment, rates spec'ed with each bar, quality of the bar, lots of strong points. You'll see how the install goes for clearances and ease of adjustment. Last edited by mmc427ss; 11/13/18 06:46 PM. Yep, the concern is bind, and force exerted on the frame mounts when at the extreme travel limits of the bar. Not exactly sure where the frame mounts attaches to the frame with that Muscle bar but as the rate goes up so does the stress on the attachment point. I felt it necessary to strengthen that point and gusseted the mounts to hopefully reduce the stress. Pretty much all the rear link bars I've seen just bolt the bracket to that lip on the frame back there. The Spohn setup has a plate to bolt to the top side to frame there to help prevent flex and bolts pulling the holes. With the three position frame brackets i made the stiffest rate setting is about two inches rearward of the frame, needed to be gusseted to reduce the stress on the frame. It wouldn't be to much trouble for these rear link bar providers to produce something similar to keep the links perpendicular when rates are changed and keeping the links perpendicular without rotating the bar on the rear housing. I'll send you a pic of the frame brackets. Rear bar rates are all over the place depending on the bars thickness and how long the "arms" are. It's good to see that Ridetech tells you what the rates are at different points of link attachment. I change the rate depending on what venue the car runs. For drag racing the bar is set at it's highest rate, for street use it's set softest, for autox I've tried full soft and medium rate. It's good to have a tune-able rate rear bar. Wish that muscle bar was available when I installed the Spohn bar, would have bought it instead. Long day and I'm tired...and another busy day tomorrow but wanted to update you all. It's going pretty well. Kept making wholesale shock changes all morning long and finally decided to put the front bar on the stiff setting and it woke the car up. This was my 4th run, and fastest. Only got one more run in after this and the driver blew it. I'm in 35th place as of now, 0.165 out of 32nd (in the shootout). We'll get a few runs in the morning to try to tighten that up but it'll be tough. All the big hitters are here, it's a blast measuring myself up against them. The heavy hitter Pros tore up the show, must have been pretty cool watching that Cobra and Camaro duke it out. Visited two car places this weekend, Sat two real deal Cobras, 289 and an SC, Sun a 260 real deal. Ever since I saw my first one in 1965 as a kid I've wanted one. Today I'd be happy just to get a ride in any of those car. Working on that. So I've had a day or so to decompress after the Goodguys 21st Southwest Nationals and thought I'd share my feelings. 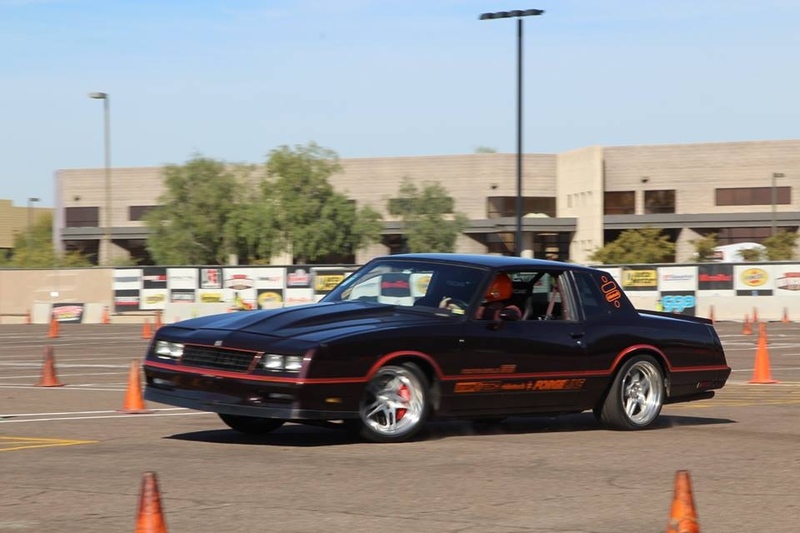 Last spring I attended my very first Good Guys autocross and loved it, but I knew I had to make some changes to my car so it would handle this kind of course better. With a much stiffer front sway bar to control the roll better, bump stops to limit front suspension travel to keep front tires off the fenders, and steering stops to keep the front tires off the frame...I felt we were ready. After watching the first run, Chris Smith suggested a major shock change, then we made another major shock change after the 2nd run...picking up almost a second on each subsequent run. Before the 4th run we made one more major change going to the stiffer front bar setting and it woke the car up. That run got me within 0.162 seconds of making the top 32 spots and the Duel in the Desert and I'm pretty happy with that. I'm certain that if I had a few more runs in the heat with that last change, I could have gotten into the show. I have to talk a bit about my StopTech big brake kit on the car. I still run a 1985 master cylinder and booster along with a 1985 disc\drum distribution valve aided only by an add on rear brake proportioning valve and the Stoptech brakes. With the rest of the car now very sorted, I can adjust the front to rear bias with about a turn and a half on the prop valve, going from locking the fronts first to locking the rears first...or somewhere in between. And this brake pad\rotor combination works perfectly...ice cold to last lap on a 20 minute road course track session including low dust street driving. I've had them on the car for a year now with a LOT of events under my belt and the pads and rotors still look almost brand new. Stoptech is adding more and more muscle car application brackets to adapt their big brake kits to the cars we love...and I highly recommend them as a fantastic all around brake package. The new R-Joints from RideTech in the rear suspension really helped tame the back down. I had zero issues with lifting the rear tire last weekend. In fact, I never touched an adjustment on the rear of the car all weekend...it just flat out worked. The new valving in the Ridetech shocks worked out great as well. I now have a base setting to make them perform great on both big SCCA style courses as well as tight tough Good Guys style courses...with just a slight twist of a couple knobs. The rest of the car just did what it does...horsepower is good, all systems held up to the abuse, FORGELINE wheels look awesome, and the car seemed to be right in line time wise with the rest of the owner\driver cars in a stacked field of competitors from across the Country. The driver actually needs more work now than the car does in order to really be competitive. Thanks to Allison for taking the picture below, can't wait for a few more on track pics to make their way to the web for viewing since I know there were several great photogs there snapping pics. Now I'm on to getting ready for the next event...once I rest up..
Did you get any video from the bleachers of your car? What was the issue with the rear bar? Questions, questions, getting like my grand-kids, WHY Pop? Local SCCA race today. Course was way more sweepers, more speed and less slaloms. I left the Proven good Good Guys setup in it just to see what it liked, stiff setting on front bar and front shocks full still low and high speed compression. Car liked it but was loose mid sweeper. Ended up taking rebound out of hte front and adjusting my line to put down a pretty good time. Here are initial raw results, I'm B18. Time should PAX pretty well with only the best of the best below the high 44s. And my third and fastest run of the day. Much more traditional course than the Goodguys setup which i think favors the Pro cars. Yep, did PAX very well. I do get the PAX thing, it's hard to look at RAW times when comparing a Miata with big slicks against a car twice it's girth on a 200 or street tire. I just try to compare cars of equal size and mods and see who is faster. You had a good day!! Guessing the windows now work well.